The Alaska Department of Fish and Game is predicting an early start for the sac roe herring fishery. But warm temperatures have made it difficult for biologists to accurately estimate when the fishery will open. The Togiak Pacific herring fishery is expecting a large run this spring – and an early start for the commercial season. According to the Alaska Department of Fish and Game, this year's season could begin as early as mid-April. That's weeks before it normally opens in early May. However, Area Management Biologist Tim Sands said that unusually warm temperatures are making it difficult to accurately predict run timing. Surfaces temperatures for this time of year are about one degree Celsius warmer than historical averages, according to the department. 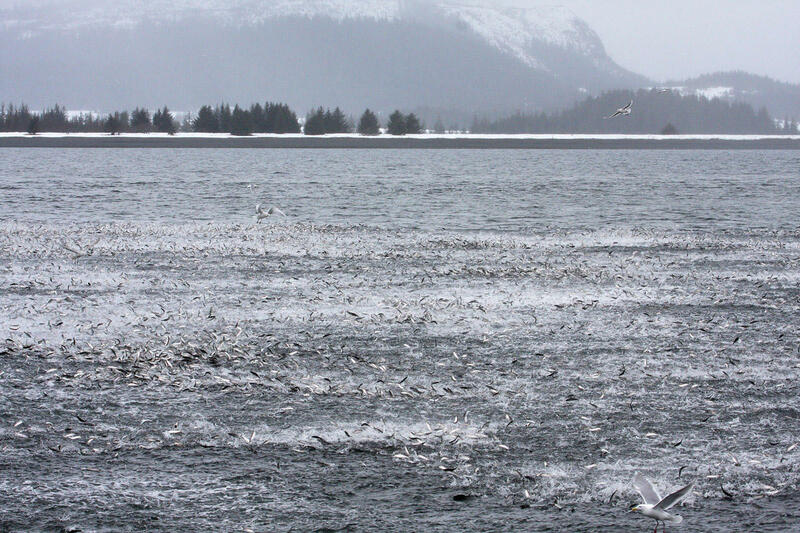 ADF&G expects 217,548 tons of Pacific herring to return to the Togiak District. That’s 59 percent more than last year. That abundance is partly due to an increase in young herring. Sands said that the biomass is usually driven by older age groups. “This year it’s different. We have all these young fish in the fishery and that’s really driving the population. So we feel like we’ve had a bigger recruitment event and a really big biomass of fish that are these younger age classes,” he said. The larger forecast means that the available harvest is bigger than last year. The Togiak District sac roe herring fishery has a quota of 26,930 tons. The Dutch Harbor food and bait fishery has a quota of 2,027 tons, and the spawn-on-kelp fishery has a quota of 1,500 tons. Still, according to Sands, budget cuts in 2016 and poor aerial surveys over the past three years have led to a data deficit. And that has prompted a conservative management approach – this season ADF&G lowered the percent of the total biomass available for harvest to 14 percent. “We kind of retroactively introduced this idea of reducing the exploitation rate by 2 percent a year for years of poor data,” he said. This spring will also see a change in allocation by gear type. At the Bristol Bay Finfish meeting in December, the Alaska Board of Fisheries approved a change in allocation, giving the purse seine fleet 80 percent of the quota and the gillnet fleet 20 percent. Previously, the split was 70 percent to the purse seine fleet and 30 percent to gillnet. ADF&G can also reallocate 50 percent of unharvested gillnet quota to the purse seine fleet. Seiners make up most of the sac roe fishery’s participants; nineteen seiners and three gillnet vessels are expected to fish this season. According to Sands, gillnet participation has decreased in recent years as the price of herring has dropped. ADF&G expects to start flying aerial surveys of the district in mid-April. The quota for the sac roe herring fishery is third greater than the 10-average harvest.